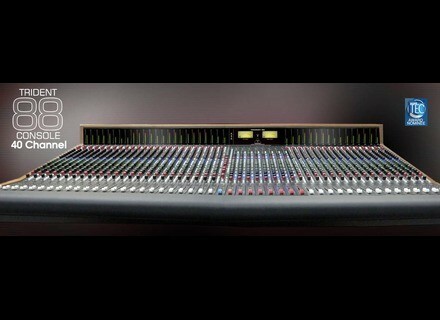 88-40, Analog Mixer from Trident in the 88 series. Trident moves upmarket with a new range of 5 analog mixing consoles that can be customized. The new Trident 88 series is based on a modular design, which allows for easier maintenance for every element and channel strip can be removed separately. Regarding the available options, you can add Lundahl transformers to any preamp channels you want and choose between LED or VU-meters. All the models are equipped with fully sweepable 4-band Trident EQs and a Tilt EQ is available on the Monitor section, with the ability to switch between them. You also benefit from a post-fader insert on the preamps so you can add external preamps and EQs, and either bypass the onboard EQ or use both at the same time. Separate Mic and Line Gain Control: Independently set your Mic and Line levels on each channel. I/P Reverse Switch: Flips channel input to the monitor section. Meter Select Switch: Allows you to choose metering from the Direct Out or Monitor Return. Fully discrete Class A design mic preamps with the option to add a Lundhal transformer to as many channels as you like. In addition the preamp has a full bypass post fader insert point that allows you to easily incorporate any external preamp from your collection or 500 Series rack. 4 band fully sweepable Trident EQ on every channel and a Tilt EQ on the Monitor section. In addition there is the ability to switch the full EQ from the Input path to the Monitor path. Furthermore the EQ has its own independent Insert. Like the preamp you can also insert to the EQ path and either bypass the EQ for any other outboard EQ or use them in conjunction with each other. Master section with 8 AUX Masters each with Solo. AFL/PFL Master with level adjustment. In addition to your main speaker outs there are also 2 separate ALT Monitors, each with level control and on/off switches. The Monitor section allows the return of 2 separate stereo signals direct into the master section with level and mute. Plug your portable device directly into the panel with a top mounted 1/8” TRS input. Talkback through the onboard talkback mic or an external mic. Monitor Section: inputs per channel allow you to easily switch your workflow from tracking to mixing. On top of that all the of the Monitor inputs have their own TILT EQ. This means you have 2 inputs per channel, each with EQ. 8 Aux sends all with pre or post fader selection, accessible on every channel. AUX 1/2 and 7/8 can be sent to the Monitor section. AUX 5/6 & 7/8 are both stereo with pan control for each. Pricing starts from $17,999. Visit trident-audio.com for full details. PMC QB1-A powered monitors We can now find in the PMC powered studio monitors catalog the large QB1-A three-way models. Apora, new tube studio processor manufacturer Apora is a new UK company that debuted at NAMM this year to introduce two hybrid processors for the studio.